Nargis, 25, narrowly escaped death during delivery of her third baby in September 2013. She came to Dhaka aged 10 in 1999 along with her family from the coastal district of Barguna as they had lost their homestead & belongings to river erosion. 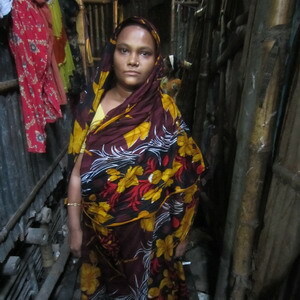 Once in Dhaka they made their home in Jheelpar Slum. She married a rickshaw puller called Zakir Hossain and successfully gave birth to two children. Nargis is a housewife and her family includes her mother; husband and the children. They live in a rented room of 10’ x 12’ sq. ft. and have to pay the rent of BDT 1,500 per month (there are no facilities – those are extra). Zakir is the only income source for the family and he earns, on and average, BDT 200 to 300 per day. Nargis conceived her third baby and, being pregnant, she visited our clinic several times. She is one of 273 pregnant women who have received antenatal check-up & treatment since the clinic opened. She also attended the monthly discussion sessions (along with 157 other women to date) entitled ‘Take care during the pregnancy period’. As a precautionary measure she was advised by our doctor to have an ultra sound scan. The scan showed that the baby was suffering from Hydrocephalus (build-up of fluid on the brain) and she was advised to return to hospital for the birth. However, her lack of education meant that she had not understood the problems her baby had and she did not show the scans to our doctor or attend the hospital again. She went into labour at home and the traditional birth attendants were unable to handle the delivery, as the legs arrived first and the (now dead) baby was left hanging due to the size of its head. During this life threatening stage, the matter was brought to the attention of our doctor and as a result Nargis was immediately hospitalised in the Dhaka Medical College Hospital. Other members of the local community have, in partnership with our clinic, formed a ‘Health Volunteers Group’ and they organised a local collection to help fund her stay and transport to and from the hospital. They managed to raise BDT 12,000! The hospital managed to deliver the dead baby and saved Nargis’ life, so there is one less family in Bangladesh without a mother to care for them. She would have died a slow and painful death if our clinic had not existed. There are of course, still lessons to be learned. If Nargis had really understood what her scan had shown, the risk to her life would have been minimised and a traumatic birth avoided. So we need to work even more closely with the mothers that we send for scans to ensure that they have been correctly interpreted. Another area we are already working on is giving the traditional birth attendants very some basic training to try and remove some of the myths around child birth while arming them with some skills to deal with more difficult births. There is a long way to go, but we are on the road and have helped many desperately poor people along the way.